Liquid mud plant is a supporting base for oil and gas drilling rigs. Normally, a liquid mud plant will service some oil rigs nearby. It is essential to keep the liquid mud plant fluently and smoothly. Once there is a urgent request from drilling rigs, liquid mud plant should mix and offer qualified drilling fluids immediately. Liquid mud plant is mostly used to make oil base mud. Diesel oil is widely stocked and used here as base oil. It has pollution to the environment. Government has strict rules and prohibits any oil leakage to environment. So there will be a dam around the liquid mud plant to prevent any leakage come out of the liquid mud plant base. In normal conditions, it is ok. But when there is a raining, things will be difficult. As the government has rules, the raining water in the initial 15 minutes within the dam should be treated. But there is so many difficult to realise it: it is difficult to control the time. which equipment should be used? And should it be processed? The liquid mud plant need to use huge quality of pure water to make qualified drilling mud. Even for the oil based mud, they need to use pure water. It should be a good idea to reuse the rain water for mud mixing. If the rain water can be used to make oil based mud, it will be a big save. The liquid mud plant can save cost on rain water treatment, as well as water for mud mixing. Another big cost is the storage of old drilling fluids. After some circulation, the drilling fluids will be not qualified for drilling, as there are too much ultra fine solids inside, the mud is weighted. Decanter centrifuge is very important at this stage, It can remove the fine solids inside the old drilling fluids and make it qualified to drilling rigs. 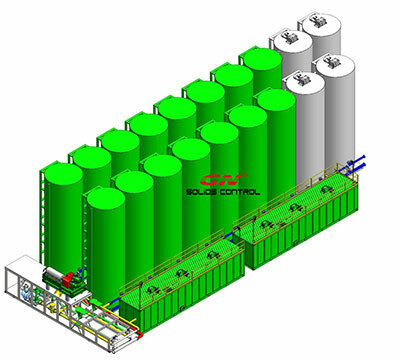 The quality of liquid mud plant depends on the mud storage capacity of each liquid mud plant. It the old mud can be treated on time after arrive the plant site, they can save cost on old mud storage.